Every accident has a story and it is often the details of that story that make a difference in civil litigation. Our Sonoma crash law firm often talks about some recurring details on this blog, looking at specific types of crashes, specific causes, and specific outcomes. Sometimes, however, we like to take a step back. Today’s post begins with a local accident and then pulls the lens back to look at the cost of car crashes in the U.S. and some proven strategies for car crash prevention. A frightening crash west of Sonoma appears to have involved two of the biggest dangers on the road: drunk driving and failing to wear a seatbelt. The Press Democrat that 50 year old Charles Purdon’s Jeep crashed into a tree off of Carriger Road on Tuesday night. Police suspect he had been drinking, noting they had received a call about a possible drunk driver in a Jeep shortly before the accident. Purdon was not wearing a seatbelt at the time of the collision, a factor that authorities believe contributed to his extensive injuries. It took nearly an hour to extricate him from his crumpled vehicle with firefighters eventually cutting the car away from Purdon’s leg which had become entangled in the Jeep’s dash. CHP officers arrested Purdon on suspicion of drunk driving. On a Motor Vehicle Crash Injuries webpage, the Centers for Disease Control’s (“CDC”) Vital Signs project, looks at the enormous costs associated with car accidents. 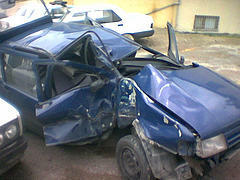 Car crashes sent more than 2.5 million people to the emergency room in 2012, with an average bill of $3,300. Of these crash victims, 200,000 were hospitalized and will face lifetime costs around $57,000. In total, Americans spend over one million days each year hospitalized because of car crashes. Collectively, the victims of crashes occurring in 2012 will spend $18 billion and lose $33 billion because of missed work over their lifetimes. The vast majority, over three-quarters, of accident-related injury costs are incurred in the first 18 months after the crash. As the CDC notes, the best way to reduce these numbers is by preventing crashes and limiting injuries using proven interventions. The CDC urges states to take several steps to advance these ends including: Using media campaigns and visible police presence to encourage compliance with traffic safety laws; Working to increase the use of seatbelts and child safety seats, and; Studying medical and crash data to shape a continuing prevention strategy. The agency also calls on employers and individuals to do their part, complying with the law and encouraging others to do the same. Many of our clients were vigilant about safety, but fell victim to crashes caused by the negligence of others. These individuals know all too well that the costs referred to by the CDC are real. As a Santa Rosa car crash injury law firm, we work with these victims to help them recover monetary damages from those responsible. Contrary to what skeptics believe, it ISN’T about looking for a windfall; it IS about compensation and recovering money to pay the very real costs of car crash injuries. It is about responsibility, accountability, and helping victims move forward from a crash that was not their fault.